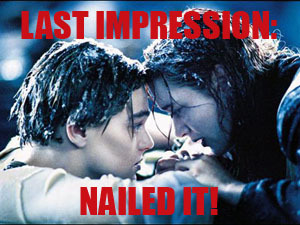 Everyone makes a big deal about first impression (rightfully so), but what about last impressions? Those delicate moments when parting ways are crucial to ensure you’ll see her again. I used to be so concerned with what to say initially that a strong goodbye didn’t even cross my mind. I hit a major milestone in my social interactions when I started paying attention to how I closed conversations. I noticed girls were instantly more responsive to my follow-up and were more likely to go on a date. When you get a girl’s number, the last thing you should do is leave right away. She’s going to feel used and that you were only there to get something from her. You want her to know that you genuinely enjoy her company. Stay an extra five minutes; you don’t need to run from her. You’ve got try your hardest to relax and make your goodbye as smooth as possible. When you stutter and fumble over your words, she’s going to be uneasy about the interaction as a whole. Awkwardness will make her second-guess giving you her number and question whether or not your next meeting will be uncomfortable, too. Slow down, take your time, and speak with conviction. If you’re vague about meeting up again, there’s less of a chance she’ll follow through. I firmly believe in setting up a date to get her number, not getting her number to set up a date. Focus on generating an activity for you to do together, and take her number as a way to get in touch…like an afterthought. Find a common interest and come up with a specific time and place, “We should see the Chihuly exhibit at the MFA on Saturday.” Now she has the date in mind and has time to look forward to it. How do you think she’ll feel if you’re immediately hitting on another girl after talking to her? Probably like she didn’t mean much to you and was just another girl who fell for your “game.” If you’re going to approach other women, be more discreet about it. Go to the other side of the venue or if you’re bar hopping anyway, wait until the next place. Don’t lose all the chemistry you created over a stupid mistake. When you walk away, you want her to think how natural it felt to connect with you. She should be pleasantly surprised and excited to see you again. Be honest and tell her how much fun it was, “I had a great time talking to you tonight.” This is simple and reinforces a positive vibe. And as always: smile, smile, smile. This is really great, thanks. Glad you enjoyed it, you’re welcome.